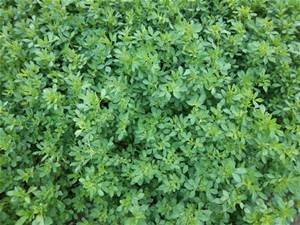 Alfalfa is popular for sprouting, wildlife food plots and for feeding livestock and pets. Alfalfa seed produces a cool season perennial that is grown in almost every state in the United States. It can survive temperature extremes of -25 to over 50 degree centigrade. Alfalfa is high in minerals, vitamins and protein making it one of the most nutritious crops that can be utilized in any forage situation whether for pasture use or as a wildlife food plot crop. Depending upon the cultivar, Alfalfa withstands a wide variety of climates and is highly drought resistant because it can lay dormant for up to 2 years when in a drought situation. THIS COATED SEED IS NOT FOR HUMAN CONSUMPTION! !